Home > About Us > Membership > Why Altra? A look at Altra’s history! The credit union was state-chartered in 1931 as Trane Employees Credit Union in La Crosse, WI. Over the years, services expanded well beyond the La Crosse, WI, area and membership eligibility expanded to include more than Trane employees. While many of our members refer to us as “their bank,” we’re not a bank. We offer the same products and services as a bank, but our structure is different. Altra is a not-for-profit financial cooperative and each member owns one ‘share’ of the Credit Union; no member has more influence than another. During the Great Depression, Credit Unions introduced themselves to America using the slogan “Not for profit, not for charity, but for service.” That principle still applies today because we exist to serve you. Management decisions are based on what’s best for our membership – not what will generate the most profit. You, as a member-owner, reap the benefits of membership and strengthen the Credit Union through your participation. Member participation helps determine the products, services, rates and fees we offer. As an owner, it’s in your best interest to use as many of your Credit Union’s services as possible. Participation can also mean inviting friends and family to join the Credit Union. If you’ve been satisfied with our products and services, please tell others who may be looking for a locally managed, safe and sound financial. What makes Altra different from other financial institutions? How is Altra different from a bank? While many of our members refer to us as their bank, we’re not a bank, we’re a Credit Union. We offer the same products and services as a bank but our structure is different. Altra is a not-for-profit financial cooperative owned by its members. Banks are owned by shareholders and are focused mainly on generating a profit. Altra’s main concerns are our members and our community. You become a member by simply opening an account. As a Credit Union member you are the owner, or one of them anyway, and you have a say in the way the credit union is operated. Decisions are made by a volunteer board of directors who are elected by members like you. Because the board is also made up of members decisions are based on what’s best for you. As a result, Credit Union earnings are returned directly to its members in the form of better rates and fewer fees. Banks profits, on the other hand, go directly to its shareholders and their customers have little say in the way the bank is operated. Make the switch today! Altra Federal Credit Union, it’s where you belong! Banks are open to anyone. Altra has membership requirements, but these can be as simple as living in a certain community, or attending school in that community. Along with checking, savings, loans and share certificates (similar to CDs at banks), Altra can be your choice for debit and credit cards, mobile banking, online banking and much more. You may feel that you see larger bank ATMs everywhere, but Altra ATMs are just as accessible. Altra is linked with CO-OP Services. This means you can use nearly 30,000 surcharge-free CO-OP ATMs nationwide for free. Altra is here for you! Overall, choosing a financial institution is a personal decision with a huge influence on how you manage your money and your time. 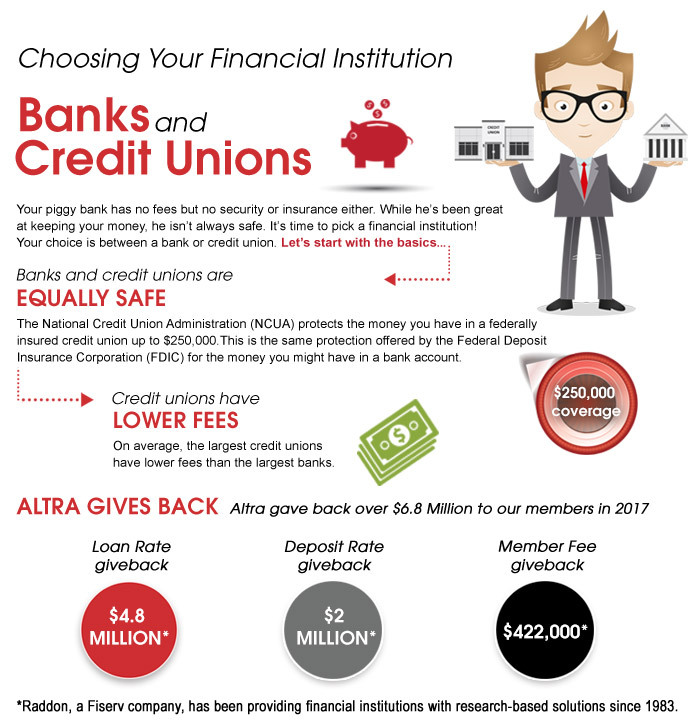 If you decide that a credit union is the right choice for you, Altra will be here to help you with products and services that are tailored to your situation to help you get where you want to be financially! Once you’ve joined Altra, you can remain a member as long as you remain an active member, even if you change employers or locations. You’ll find that Altra really is where you belong! *Infographic Sources: American Bankers Association, Consumer Reports, Credit Union National Association, Datatrac, Forbes, University of Wisconsin Center for Cooperatives, U.S. News & World Report and Wise Bread. Thousands of shared branches; find one near you. Thousands of surcharge-free ATMs; find one near you.